Home > Be Spiritual > Philosophy - Wisdom > What Does Namaste Really Mean? Some of us felt awkward the first time we put our hands together in a yoga class and said ‘Namaste’. Over time it comes more naturally, but I still didn’t really know what I was saying for years. So what does it really mean? A simple definition for this Hindu greeting is "I bow to the divine in you". When we bring our hands together, this is symbolic. The left hand is said to represent the world of form, the right hand represents the unseen part of our reality. When we bring our hands together before the heart chakra, we acknowledge that these dimensions are not separate. We bow our heads and close our eyes in surrender, connecting through our hearts, not our minds. Through yoga and meditation, we may discover an even deeper meaning to this ritual greeting, which cannot be fulfilled unless we are ‘awake’. What is it to be ‘awake’? The sages say it is difficult to talk about what it is to be ‘awake’, because we awaken when we free ourselves from thought. We understand by being it, not by knowing it. Indeed, explaining an experience of awakening in words can be a bit like explaining the color green to someone who is color-blind. This is why we ‘awaken’ through meditation, through examining our own experience, rather than through books. We need to see "green" for ourselves; words are mere signposts to this experience. So how do we "see green" so to speak? This is exactly what yoga and meditation are designed to do. Both are aimed at ‘stilling the mind’ and getting us into the present moment, which is where all the magic happens. What’s so good about the present moment anyway? Being a very mind-heavy person, I sometimes wondered why people made such a big deal about the present-moment. I gave it so little attention that whenever I glanced at it, it seemed very shallow and 2-dimensional. Boring really. Sure it’s nice to smell the roses, but surely the present moment is much less interesting than the elaborate virtual realities my mind had created out of the past and future? Surely it is much less important than the empire of knowledge I had created about the world and how it works, right? Wrong! When we redirect the boundless resource of our attention away from the thinking-mind, and pour ALL OF IT into the present-moment, we might discover something astonishing: the present moment contains everything you will ever need to know. That is because it is in the present, and only in the present, that we can wake up to what we are. How can meditation help us wake up to "what we are"? When we sit down to meditate, letting everything be just as it is, after time we may start to notice a space of awareness that is bigger than our thoughts, emotions, and sensations. It is this space that does the watching. At our barest essence, we are this space, because this silent stillness holds everything else. Without thought soaking up our attention, we can give all our attention to this space of awareness. We may find this awareness, this spirit, this "alive nothingness", is everywhere, and is in everything. It is "me". It is also "you". And it is the trees and cities and oceans. When experienced through the human heart, it is love and peace and joy. We may eventually discover there is no separation between what is experienced and what is experiencing. It is, we are, all One. What does all this have to do with “Namaste”? I sometimes heard snippets of yoga philosophy that claimed things like "the whole universe is in you" and "you are the whole universe", and became very confused. I’m only 168cm tall – how could it fit? How could I be the whole universe, when I can only perceive a tiny, teeny weeny fragment of it? It didn’t make any sense! But of course, I was thinking in terms of the world of thoughts and things. The reason I can say “I am the universe” is that “I” am this vast awareness, distilled into a single point of view. For me, I know I am "awake" when I recognize that the awareness that shines out of my eyes, is the same awareness shining out of yours. 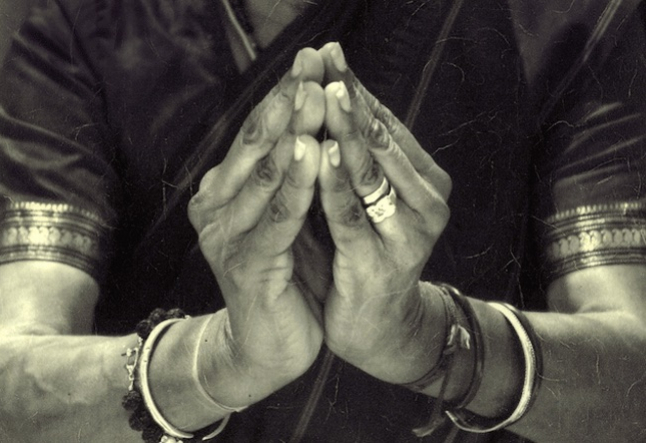 Check our other Article on the Meaning of Namaste here.